Arjo Atayde's ex-girlfriend, Sammie Rimando (right), gives intriguing message to the actor now linked to Maine Mendoza. Karylle (left) also gives a message to her ex-boyfriend Dingdong Dantes. The hosts of It's Showtime gave a shoutout to their exes in a fun-filled episode of the ABS-CBN noontime show. Karylle was put on the spot while Sammie Rimando, the ex-girlfriend of Arjo Atayde, gave an intriguing message for him during the April 4 episode of Showtime. It all started when the members of GirlTrends were asked to give their messages to their ex-lovers after dancing to the tune of "Shoutout To My Ex." Karylle praised the girl group then told the audience: "Shoutout to my ex daw, sabi ng mga GirlTrends. Siyempre, ang sarap sa pakiramdam pag naka-move on na kayo sa ex, di ba? "Yung tipong, 'Who you?' ka sa akin ngayon." Karylle then turned to the members of the all-girl group and asked: "Sino sa inyo ang handang sumagot: 'Ano na ang ba ang 'shoutout to my ex' ninyo?" Sammie Rimando answered, "I'm happy for you but I'm happier." The Kapamilya talent was in a relationship with Arjo Atayde for over a year before they broke up in November 2018. In January 2019, Arjo disclosed that he and Maine Mendoza were "exclusively dating." The other Showtime hosts then gave their messages to their exes. At first, Karylle did not answer the question as she said, "Okay na lahat, e."
Vhong Navarro teased her by instructing the audience to look at Karylle and wait for her to open up. The other hosts then put her on the spot by sitting down on the floor and looking at her while waiting for her answer. Finally, Karylle faced the camera and said, "I'm gonna knock on your door, you'll ring on my bell. "Peace na kami. Kayo talaga." 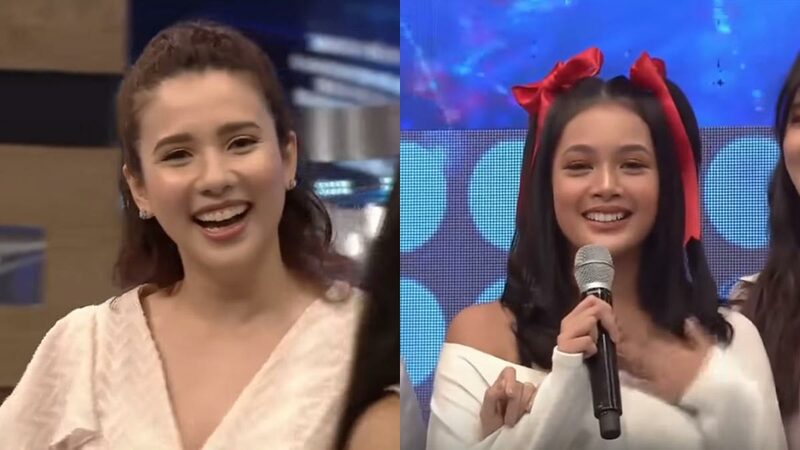 Amy Perez disclosed that Karylle showed hesitation when she was assigned to ask the GirlTrends members about their messages for their ex-boyfriends. She disclosed, "Kanina, nung nabasa ni K yun, sabi niya, 'Itatanong pa ba natin 'yan? Parang huwag na.'" Karylle added, "Bilang napagdaanan ko na rin 'yan." Suddenly, the DJ played background music that had the lyrics: "Ding ding dong." Karylle used to be in a relationship with Dingdong Dantes when she was still part of GMA-7. She left the Kapuso Network in 2008 and transferred to ABS-CBN. Yael Yuzon is now her husband after they got married in March 2014. Meanwhile, Dingdong got married to Marian Rivera in December 2014.